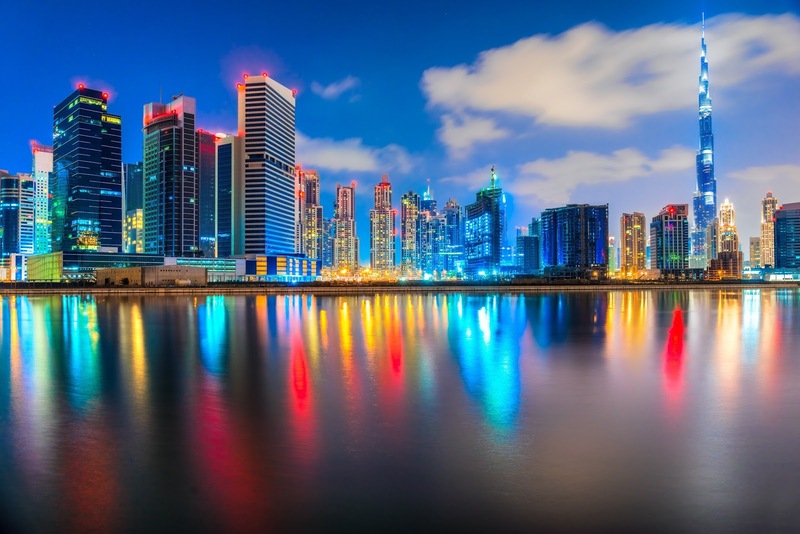 In an attempt to diversify away from it's Oil-Focused economy and to strength its international tourism industry, Dubai has demonstrated to the world how they have a an incredibly luxurious city based on it's riches earned from the oil industry. Below is an excerpt from A History of Future Cities, on Dubai’s transformation from outlandish idea to an economic powerhouse of the Middle East. The world became acquainted with Dubai only a few years ago. The city that launched a thousand magazine features was presented to Westerners as many things: Rich, strange, tacky, threatening. But most of all, it was presented as new. The instant global metropolis with a “skyline on crack” captivated the world with record-setting skyscrapers, indoor ski slopes and a stunningly diverse population. With 96 percent of its population foreign born, Dubai makes even New York City’s diversity — 37 percent of New Yorkers are immigrants — seem mundane. As a pair of American observers put it, Dubai is a city where “everyone and everything in it — its luxuries, laborers, architects, accents, even its aspirations — was flown in from someplace else.” But for all the breathless coverage of Dubai’s supposedly unprecedented emergence, the only truly new thing about Dubai is the “flown in” part. Dubai was touted as a new phenomenon, but it is actually just the most recent iteration of a far older one. For 300 years, instant cities modeled on the West have been built in the developing world in audacious attempts to wrench a lagging region into the modern world. While the rise of these global crossroads cities was once checked by the speed of ocean liners and locomotives, today their growth is powered by intercontinental jets that can move a passenger from any major city in the world to any other in a single day. So while the city of Dubai is new, the idea of Dubai is not. It’s just that in the age of jet-powered globalization, the idea can achieve liftoff as never before. Whatever the motive and background, today Dubai has presented to the world with many stunning architectures which are absolutely breath taking to even look at them from photos. We have selected a few amazing photos of many of the landmarks. The Burj Al Arab is being called the world’s only 7 star hotel for good reasons. This luxury lodge is the third tallest hotel in the world but with only 28 floors. No space is wasted, though – every single one of the 202 suites is big and luxurious enough to house royalty. 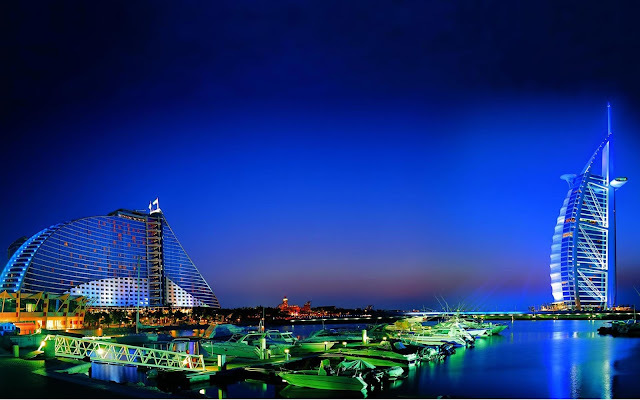 At a height of 1056 feet, the Burj Al Arab is a marvelous vista to admire and is an absolute landmark of Dubai. Its architect, Tom Wright from WKK Architects, has given the hotel an interesting form resembling a ship sail. It blends perfectly well with the underlying land. With a US$20,000/night price tag, it is not atypical for most travellers. While spending the night there is too far away, we can always take a view inside by reserving a seats in the one of Burj Al Arab’s equally luxurious restaurants. It is still an expensive option but it will be far less then spending a night there in the royal suite. It is definitely a must see item if you visit Dubai. The World Islands is a collection of many man made small islands arranged to look like a world map. They are located in the waters of the Persian Gulf, 4.0 kilometres (2.5 mi) off the coast of Dubai, United Arab Emirates. 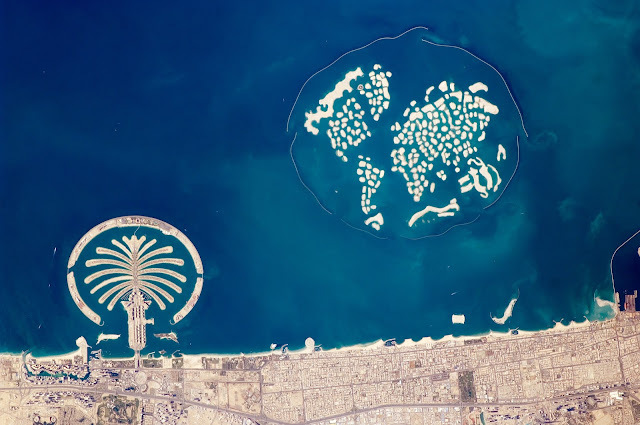 The World islands are composed mainly of sand dredged from Dubai's shallow coastal waters. Like many structure in Dubai, they form a member of many artificial island developments in Dubai. The project was originally conceived by Sheikh Mohammed bin Rashid Al Maktoum, the ruler of Dubai. It began in 2003 and only partially completed due to 2008 financial crisis. 60 percent of the islands had been sold off to private contractors back in 2008 Kleindienst Group. As of late 2013, only two of the islands had been developed. However Kleindienst Group announced the launch of "The Heart of Europe" project as a focused continuation development of the World Islands; As the name implied the first of these series of islands will be for those countries in Europe such as Sweden and Germany. Palm Islands are two artificial islands, Palm Jumeirah and Palm Jebel Ali, on the coast of Dubai. 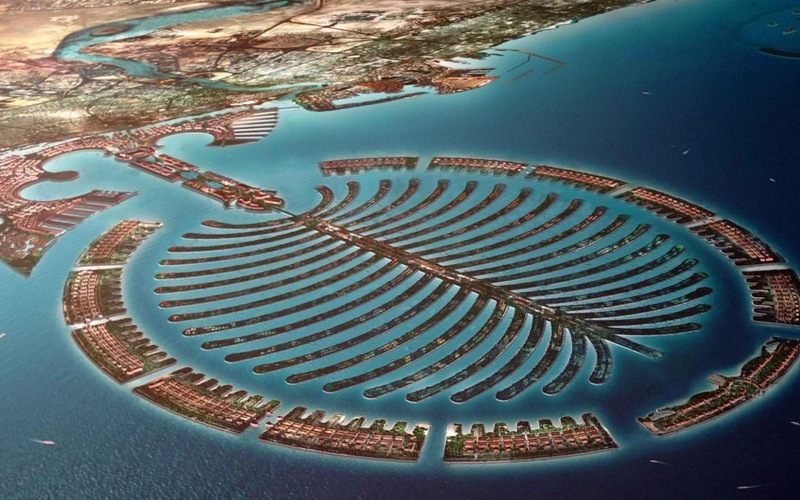 As of November 2014, only Palm Jumeirah has been completed. This island takes the form of a palm tree, topped by a crescent. When complete, Palm Jebel Ali will take a similar shape; both islands will be host to a large number of residential, leisure and entertainment centres and will add a total of 520 kilometres of non-public beaches to the city of Dubai. The creation of the Palm Jumeirah began in June 2001. Shortly after, the Palm Jebel Ali was announced and reclamation work began. A third island was planned and construction started, but this project was later remodelled and renamed to Deira Island. Burj Khalifa (Arabic: برج خليفة‎, "Khalifa Tower", pronounced English /ˈbɜrdʒ kəˈliːfə/), known as Burj Dubai before its inauguration, is a megatall skyscraper in Dubai. It is the tallest artificial structure in the world, standing at 829.8 m (2,722 ft) at the time of its opening in 2010. 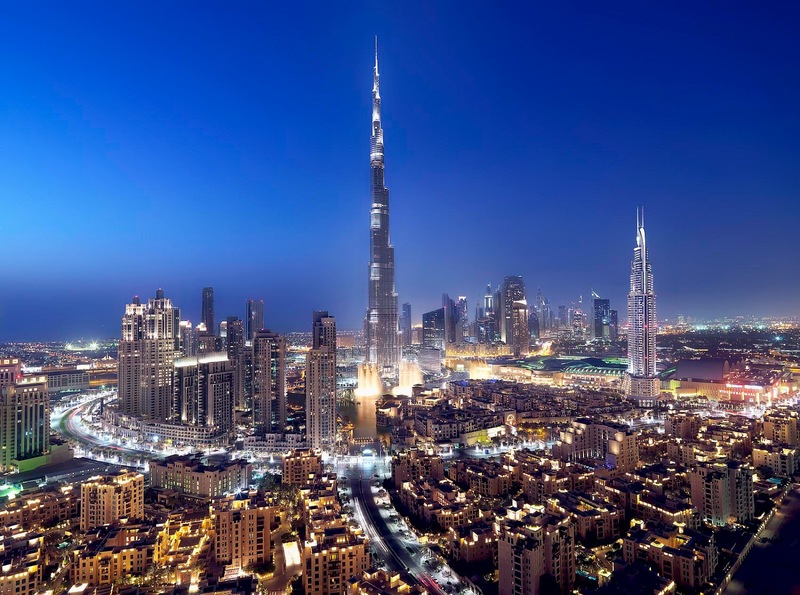 Construction of Burj Khalifa began in 2004 and completed in 2010. 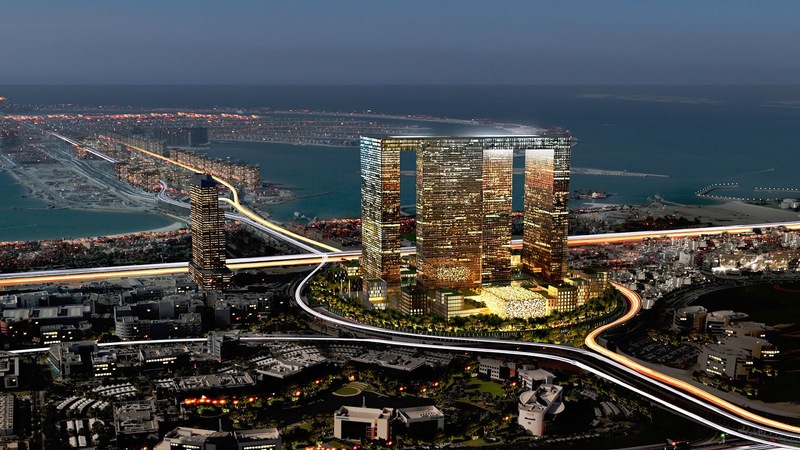 It is one of the key projects as part of the new development called Downtown Dubai. It is designed to be the centerpiece of large-scale, mixed-use development. The decision to build the building is reportedly based on the government's decision to diversify from an oil-based economy to develop a stronger international tourism industry. The building was named in honor of the ruler of Abu Dhabi and president of the United Arab Emirates, Khalifa bin Zayed Al Nahyan; Abu Dhabi and the UAE government. The design of Burj Khalifa is derived from patterning systems embodied in Islamic architecture, incorporating cultural and historical elements particular to the region such as the spiral minaret. The Y-shaped plan is designed for residential and hotel usage. Love your photos. Wish you could have done a piece on Doha, Qatar 🐪 the richest country in the World.